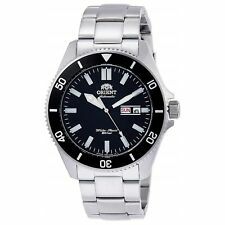 Titanium Watch With Blue Dial. Responses will be provided within 24-48 hours. Instantly upgrade your wristwear collection with this Citizen Eco-Drive men's analog watch. This Citizen model features a round face with a brushed finish and an analog display. It features a leather band, adding a stylish touch to your wrist. Upgrade your accessories with this Citizen Eco-Drive watch. 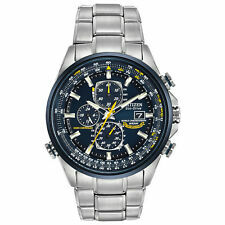 I am partial to Citizen watches, especially the Ecodrive powered models. Also, due to skin allergies I can only wear watches with titanium backs. I bought this watch for casual wear. Fit, finish and overall function for the price is great. I would not consider buying a different brand or model. It's a great watch. Does everything it describes very well. The perpetual calendar is great, the chronograph feature has a mode you switch to before it works, which is odd. Other than that this is great. My new favorite watch. The mineral crystal is a little soft so be careful. The titanium is holding up great though. I like the look, the style and the comfort of it but the set up instructions and very complicated. I had to google a couple of sites in youtube to get it going. However, I later found instructions at the Citizens website. Everything about this watch is pure class. The leather band goes perfectly with the bezel and it has a cool vintage vibe to the whole thing. I actually checked at first to see that it was made from metal the titanium is that much lighter. All the functions work perfectly and it was hassle-free to set up if you follow Citizens web video. If I had to gripe about anything it would be nice if had day and date and a sapphire crystal. Of course it's made by Citizen so you know you are getting a quality timepiece. Hands down this is one of their most beautiful watches they've made - just fabulous.